The planet Zenobia has just been discovered, and before you can finish reading the announcement, you’ve given the order to move out. Real estate is expensive in this part of the galaxy, and as a galactic developer, you have to move quickly to get a leg up on the competition. Yet for as much as you want to make the most money, you still kind of need the competition. Developing is expensive work to get into, and you could still kind of use the help. Not too much help, though. Sharing the load means sharing the glory. And you want the glory all to yourself. 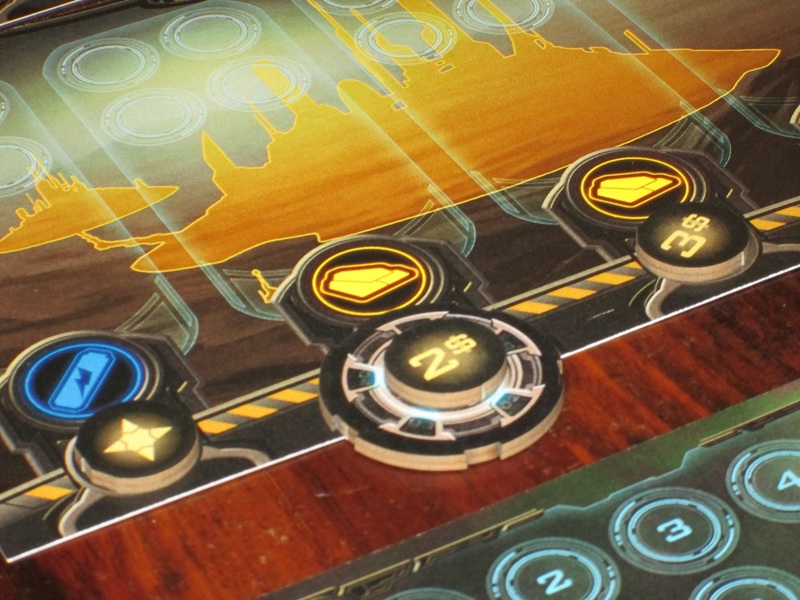 Planet Rush is a semicooperative negotiation and area-majority game for three to five players. Players are corporations seeking to colonize Zenobia. The player with the most points at the end of the game wins. Planet Rush set up for four players. 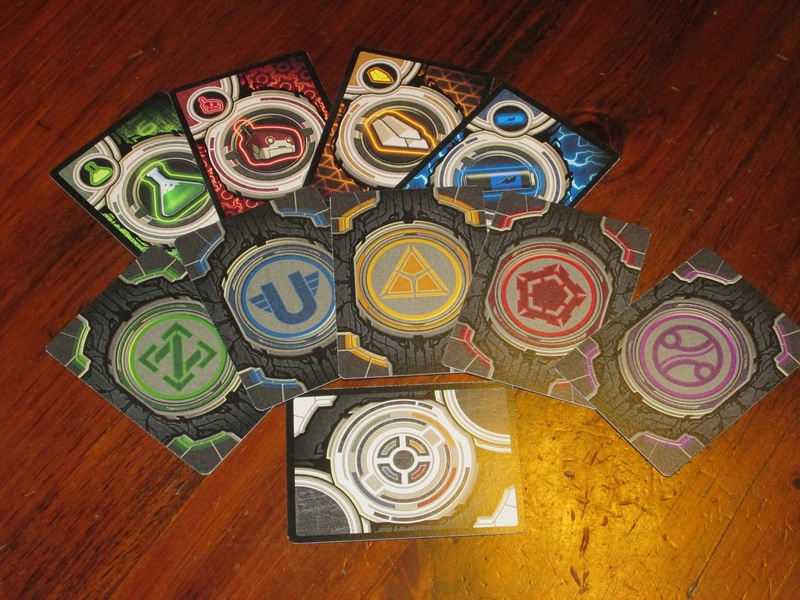 Each player receives a faction board and matching faction card, four cards from the components deck, and a set of cubes in their color. The eight structure cards are placed in the center of the table, in-progress side up, and the bonus markers are shuffled and placed under each of the building segments. Players choose a start player and begin. 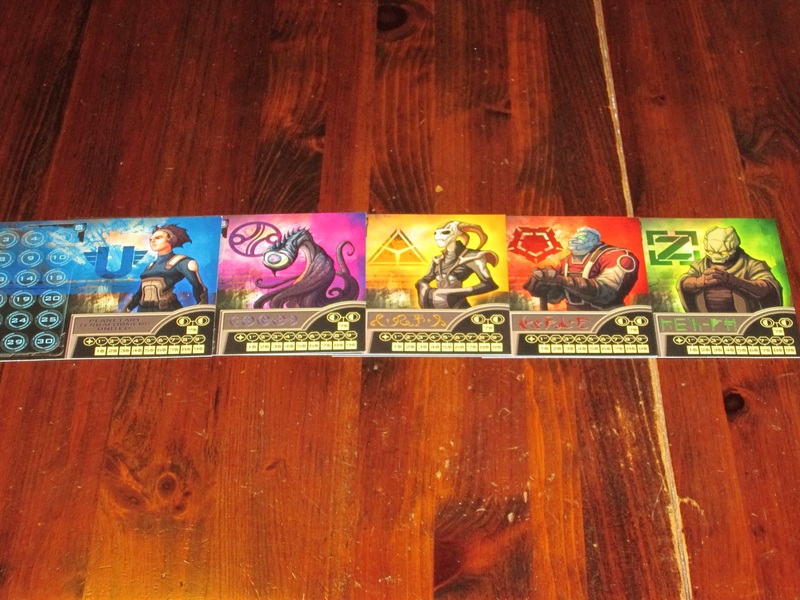 Each player receives a corporation sheet for their faction. Each corporation is individually illustrated, which is unnecessary but a nice touch. At the end of every turn, whether a player suggested building or drew a card from the deck, each player draws a card, and the next player clockwise becomes the active player. Whenever a structure has all of its segments built, the structure is scored. Whoever contributed most to the structure gets points based on how much they contributed. 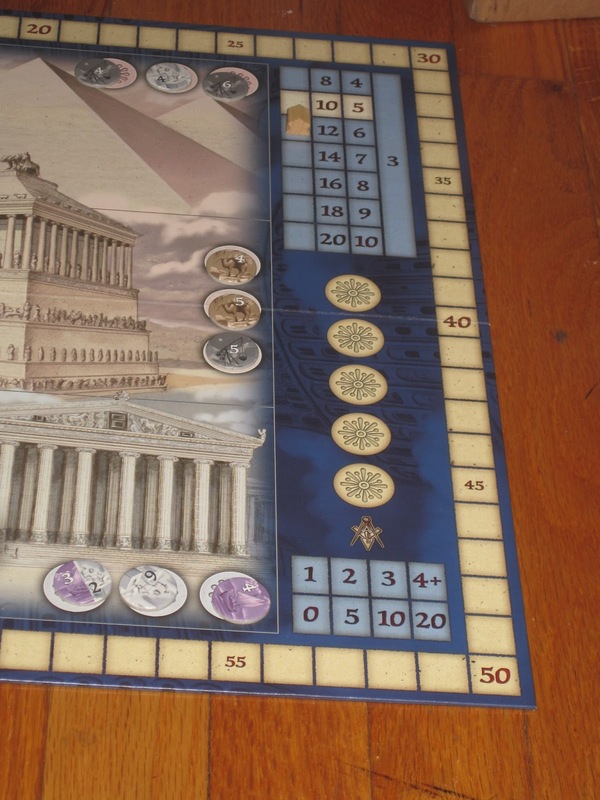 The game ends whenever the seventh structure is scored. (The eighth structure is never scored.) Players receive bonus points for contributing to five, six, or seven of the structures. Whoever has the most points wins. Prime Real Estate, or Housing Bubble? 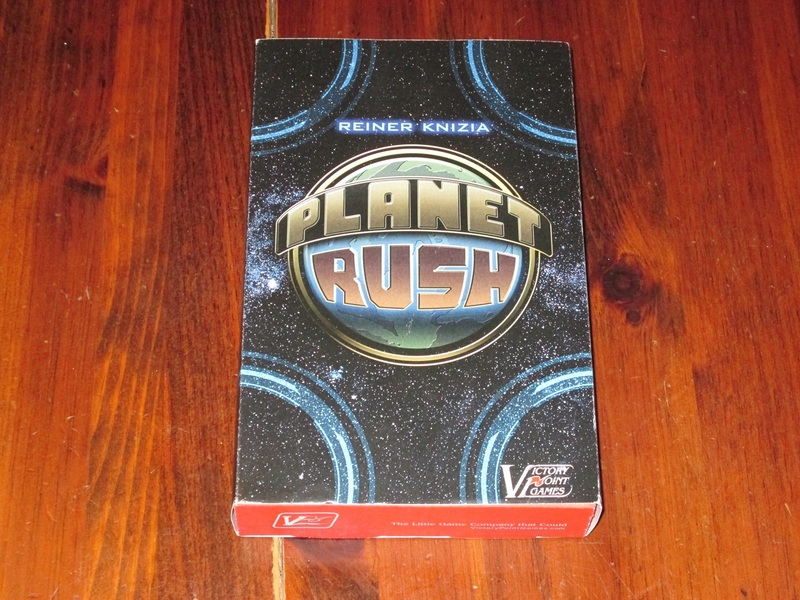 Planet Rush has been described by the publisher as the “designer’s cut” of Reiner Knizia’s 2005 release Tower of Babel, a game that I like very much. I was excited to see that the game was getting a new release, although I was nervous about some of the rules changes I read about in advance. Now, after playing Planet Rush, I am impressed by how different it feels from Tower of Babel and also what a great negotiation system both games use. The launch pad token shows other players which segment the active player wants to build. Planet Rush is a negotiation game, but it feels very different from what are typically billed as negotiation games. The reason is that most negotiation games give players free rein to promise whatever they want. In Cosmic Encounter, the attacking and defending players might agree to play negotiate cards rather than playing through the attack, but it’s easy for players to backstab. Many negotiation systems allow players to not fulfill their promises. Some people love this; I am not one of them. If you similarly don’t like the freewheeling, anything-goes style of negotiation, then Planet Rush will be a breath of fresh air. The game is in each player determining what they want, discerning what other players want, and then acting accordingly. Players are acting cooperatively in the sense that they need the other players’ participation to accomplish their goals, but the game is won independently. So your choices are mostly maneuvering to get other people to do what you want–making your self-interest seem like their self-interest. The cards in Planet Rush. 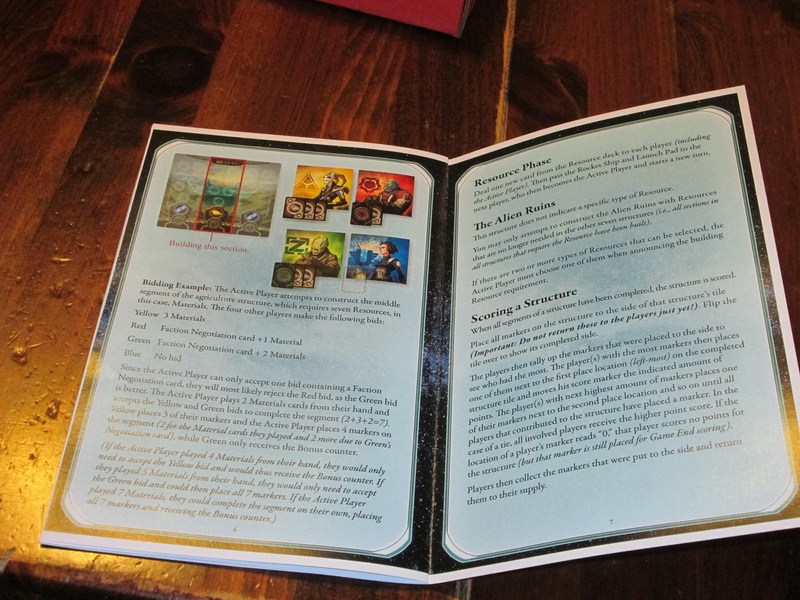 These are standard-size cards, which are easier to hold than the smaller cards in Tower of Babel. But all of this is done in a rigid system of offering cards. First you have to have the resources necessary for a deal–you can’t trade future promises that can later be broken. And then you have to decide how much to offer, because resources once offered cannot be negotiated further. If you want your offer to be accepted, you have to guess at what the active player wants and offer accordingly. In one game I played, I knew the active player wanted to play most of the cards necessary to build the segment he was proposing, and I knew I needed to get on this segment to get into this structure so I could get a better end-game bonus. Even though I had more cards of the type needed in my hand, I offered just one. Another player offered two, and sure enough, my offer was accepted and his was not. While it is strategic as the active player to cut some players out of building and not others at times, many times your job as the active player is to follow your self-interest. And players who play well to this impulse will do better than others. The faction card on offer. That faction card can change everything. 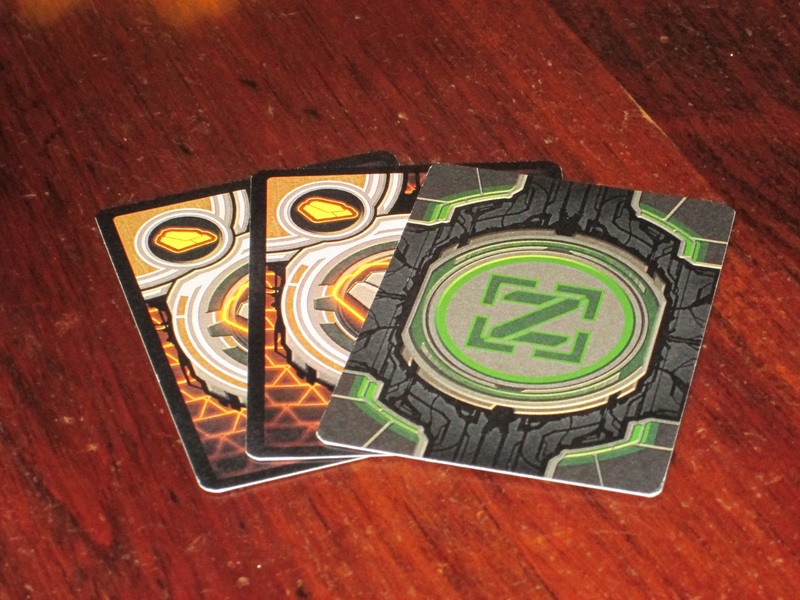 The game’s system of negotiation is complicated somewhat by the faction card that each player is holding in their hands. When the faction card is played as part of the offer, the offering player is switching things up, offering to forgo placing cubes on the structure in order to claim the bonus token. 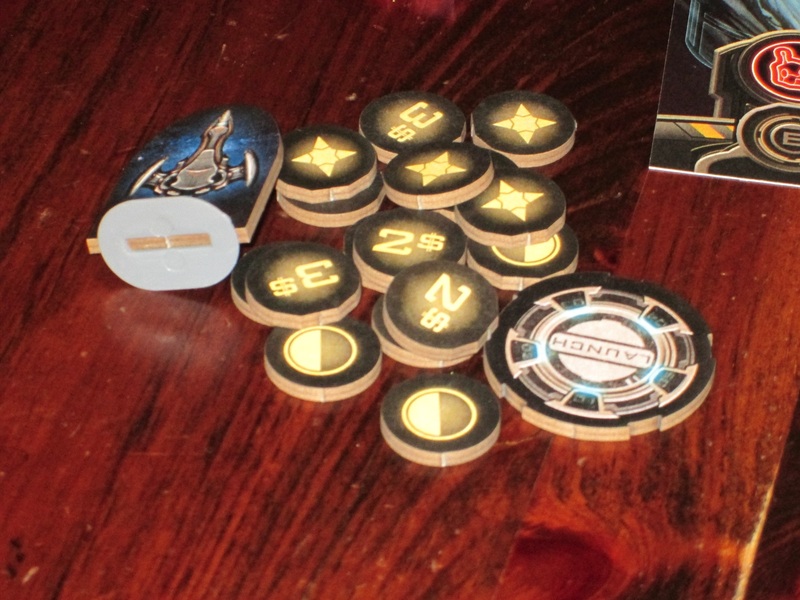 The bonus tokens in Planet Rush involve set collection, and so they have variable value depending on the player. Card resources are precious in the game, so it is sometimes tempting as the active player to forgo a bonus token in order to save resources and still place cubes on the structure card. However, since only one offer with a faction card can be accepted, players have to use this option sparingly: if too many people offer the faction card, the project will likely fail. The faction card also allows players to control the value of their offers: putting a faction card with a low offer is saying, “This is only worth it to me if you give me something really good,” whereas putting the card with a high-card offer means a player really wants the bonus token. The faction cards and bonus tokens give the active player and offering players lots of different ways to exploit the central negotiation system in Planet Rush. Bonus tokens are worth differing amounts of points, depending on their type (and what else you’ve collected). The bonus tokens are helpful because they guide players toward what they should build. Seeing all the different segments on the structure cards can be a bit daunting, but the set collection can drive decisions for what to build. And the tokens are interesting. There are four tokens that are worth nothing if you just have one but worth 7 points if you manage to get two. There are some that are worth straight points when built. And there are others that are worth more the more of them you have. (They follow a pyramid scoring system, so the first is worth 1, the second 2, etc.) Most of the tokens have a variable value depending on who wants it, and this makes the faction card even more interesting. 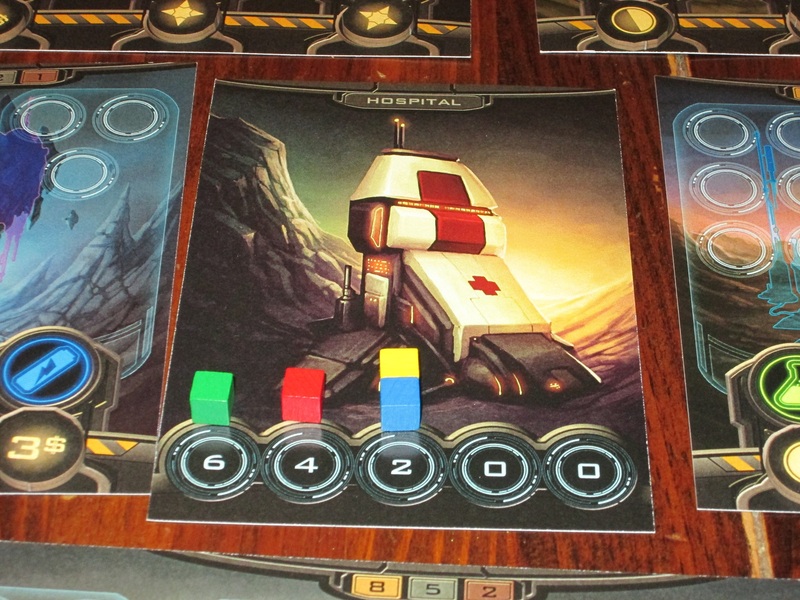 The small structures force players to manage their resources well. You do not want to be left out of building these. Aside from negotiation, Planet Rush is also a resource management game. Resources are scarce, so using them to build one thing means you won’t be able to use them to build another, and it can take a while to replenish your hand. Whenever I explain the rules, people always think that using your turn to draw a card is a waste. But one of the tricks in the game is knowing when to forgo building in order to gather strength. A failed build is worse than using your turn to draw a card, as is a build that is more advantageous to other players than to yourself. Similarly, it might be better to allow someone to take the bonus token if it allows you to save your resources for a more opportune time. Knowing when to play and save resources is another fun tension in the game. The player boards are nicely illustrated and have a nice bonus token scoring chart, as well as a place to track your score. The components in Planet Rush are good. The art on the player and structure mats is great. These mats are on cardstock, not chipboard, but they work fine. (They can be hard to flip on the tabletop, and some of the corners on mine are bending because of this.) The player pieces are cubes, which work fine. The cards are hard to riffle shuffle, but I like that they are full-sized cards rather than mini-cards (even though this isn’t necessary). The cardboard pieces are the customary laser-cut Victory Point Games ones that require a wipe-down with the included napkin, but they work well here. 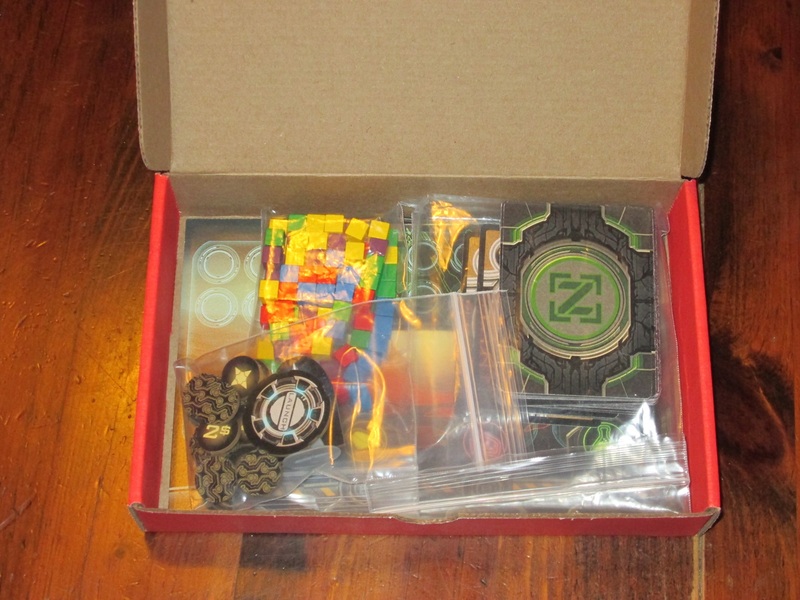 The box is small, which is appropriate for a game of this length and weight, but do be advised that it takes up a not inconsiderable amount of table space. The game plays three to five players. I much prefer it with four or five. It plays quickly, usually in 45 minutes or so. 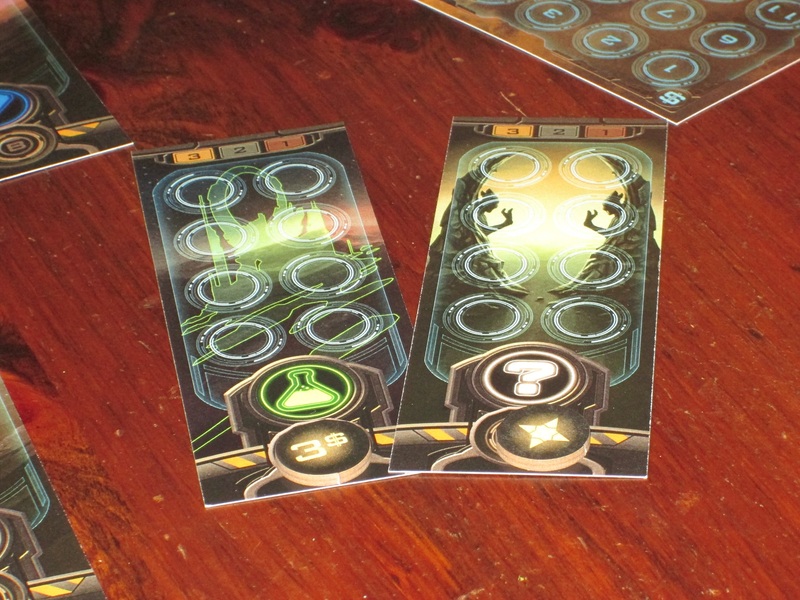 The tokens in Planet Rush are the usual Victory Point Games laser cut ones, but they work well in this game. I like Planet Rush quite a bit, but I do imagine some people will find it dry–probably the people who like the kind of negotiation games I don’t. It’s the kind of game that, to me, is reliably good, consistently delivering a fun experience, but it’s not the kind of novelty that attracts attention, so you might have to contend for it to get it played at game night. And the components, while good enough for the game, aren’t likely to draw people in on looks alone. I think Planet Rush is a very good game, but I wouldn’t expect it to provide more than I’ve described. Planet Rush is a fun, quick, simple game that nevertheless offers good choices and fun negotiation. It’s fun to try to get into others’ heads and make them offers they can’t refuse. The narrow point margins in the game keep players on their toes–they can’t afford to miss out and have to take any gains they can–which provides the tension in the game. And the game is directed entirely by player choices, which means it’s different every time you play. While this game won’t be for everyone, it’s a game I enjoy quite a bit. As I mentioned above, Planet Rush, while clearly in the lineage of Tower of Babel, is an entirely different game. I’m not sure whether that makes it better, but it doesn’t make it worse. Ties are friendly, and there isn’t much of a point differential between the different scoring positions, making points scarce. This incentivizes players contributing to each structure and collecting bonus tokens, a shift from Tower of Babel. In Tower of Babel, offering players receive 1 point for each card offered that the active player refuses. This system favors players having their offers refused. Players walk a tight line of trying to offer what will help them score the most points without making the offer so enticing that it will be accepted. This system is brilliant, and when I read it would be absent from Planet Rush, I thought all the teeth were removed from the game. But Planet Rush has some other systems in place to make up for this. Planet Rush favors helping other players build, so the cooperation implied in “semicooperative” is more in view here. Players want to help their opponents complete structures because it’s advantageous. Points are scarce, and the only way to get them is to help build. So players have to make their offers as appealing as possible, and this has its own challenges. You have to get inside the head of the active player and decide what that player wants, tailoring your offer to appeal to his or her sensibilities. This is great fun; it’s also very different. The art on these structures is gorgeous. Funneling players toward this are the huge end-game points given to players for contributing to five, six, or all seven of the completed structures. If you can get involved in all seven structures, you get fifteen points, which is no small amount in this game. But doing this can be a challenge. Unlike Tower of Babel, where every wonder is effectively the same as every other (each has three building discs, the colors of which vary from game to game), Planet Rush offers stable options for structures, but the number of segments in each structure is variable. And what makes this interesting is that two of the eight structures have only one segment, meaning after one build, they are scored. And since only one structure isn’t scored each game, at least one of these will be completed each game. Getting left out of a segment isn’t a big deal on a four-segment structure; it is a huge deal on one of these one-segment ones because it can cut you out of end-game points. So players have to be especially careful not to throw their resources away elsewhere, and they have to make certain that if they are not the active player when these structures are built, the active player will cut them in. The segments in Planet Rush often require more resources to build than in Tower of Babel, forcing players to rely on one another. This system of prioritizing building may seem to favor the active player, but the segments in Planet Rush generally require more cards to build than in Tower of Babel. A common turn in Tower of Babel is building a segment yourself because the other players are playing their minigame of squeezing points out of cards they don’t really want to offer. This is much more rare in Planet Rush, both because of the larger segments (which require more outside participation) and because of the limited cards available. In Tower of Babel, the construction deck is huge, and it’s hard to monitor how many cards the other players are holding. 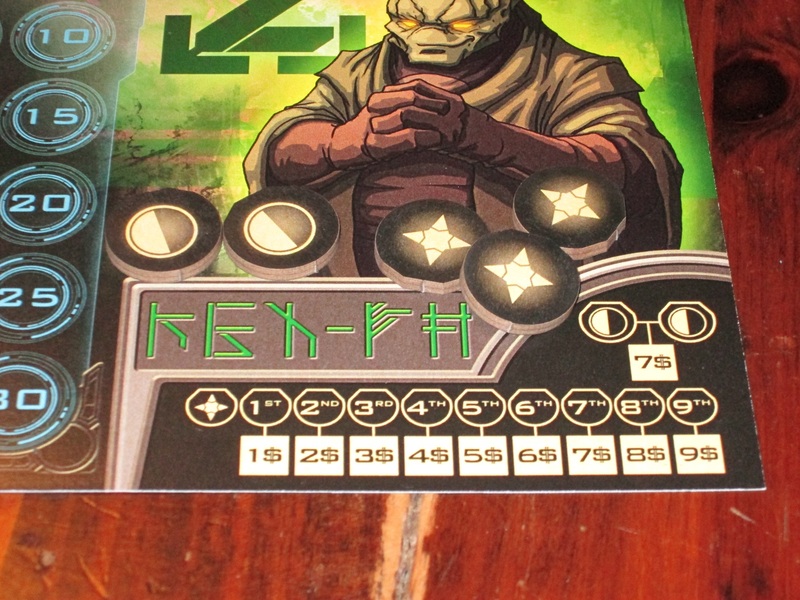 In Planet Rush, there are fifteen of each component in the deck, and reshuffling is a frequent occurrence. It’s simultaneously easier to track cards and harder to build things on your own. So other players really are required. The scoring table in Tower of Babel differentiates more between the different places in scoring each building. The scoring structure is different in Planet Rush, with ties being friendlier and fewer points separating first, second, and third place. Again, the scoring structure suits the different goals in Planet Rush. Finally, the bonus tokens are much more dynamic in Planet Rush. 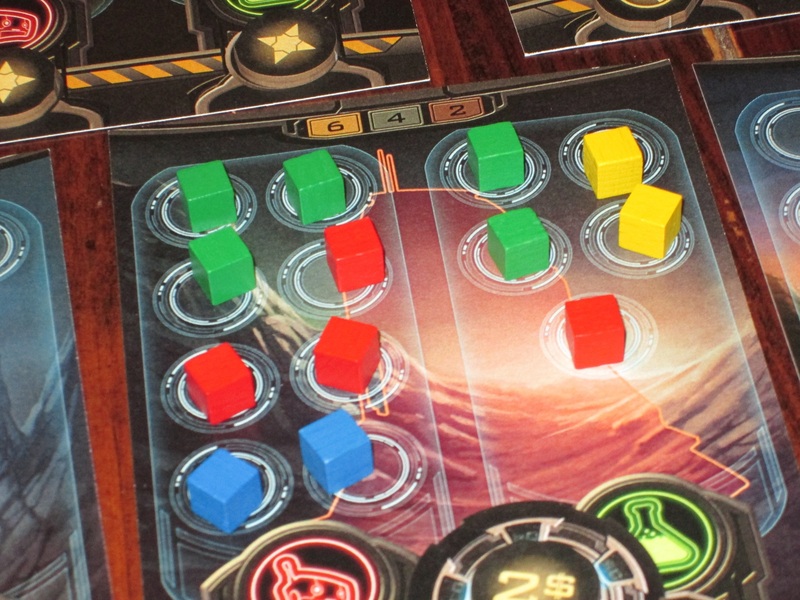 While each of the colors scores the same way in Tower of Babel, in Planet Rush, the three types represent different scoring schemes altogether. One is worth straight points, one makes each token of that type more valuable (pyramid scoring), and another scores big points, but only if it’s scored in pairs. 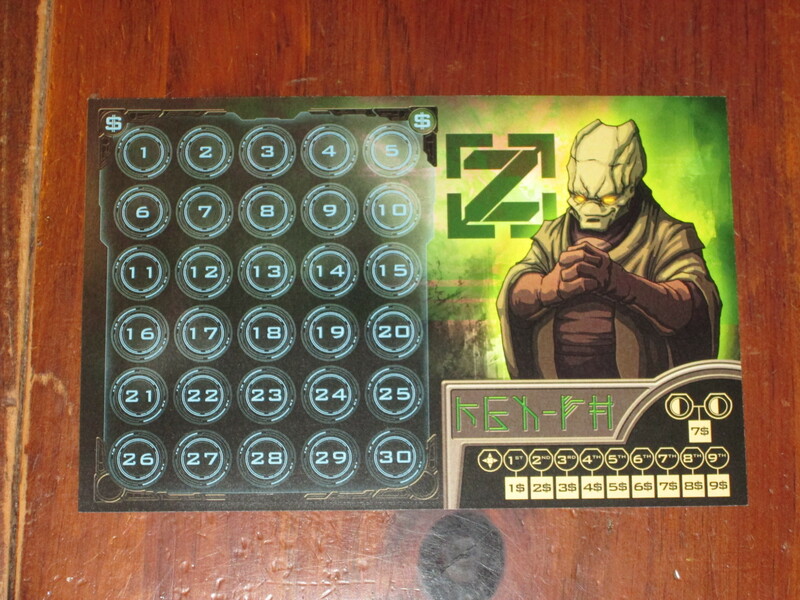 I really like this token structure, even if it means the color requirements are fixed from game to game. The small-box size of Planet Rush is perfect, even if component quality (not illustrations) is superior in Tower of Babel. 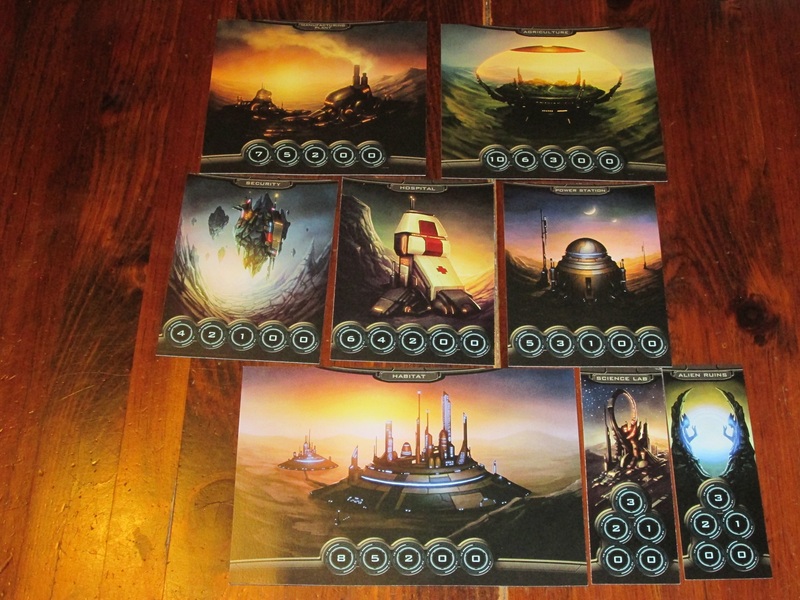 As for components, I prefer the theme and wooden pieces of Tower of Babel, but the larger cards and more evocative art of Planet Rush are great. I also like the smaller box size. I’ve always enjoyed Tower of Babel, but I’ve thought the box is bigger than the gameplay merits. Planet Rush recognizes its place as a short and sweet game and occupies shelf space to match. Because of the tension of cutting players into/out of structures, I think Planet Rush is less interesting with three than Tower of Babel is, but I think it’s just as good with four or five. The rulebook is illustrated with full-color diagrams, but there are a few gaps in the rules (how many cards can be offered? what happens when a player runs out of cubes or all the cards are drawn?). Still, it’s serviceable. Hopefully this gives you a sense of how Planet Rush compares to Tower of Babel. For my part, I still don’t know which game I prefer. The games are quite different in feeling even though they are similar in rules, and so it’s probably not necessary to keep them both (even though you can’t really port the rules from one into the other). But at this point, I have no idea which I plan to keep. I’d better keep playing both to decide. 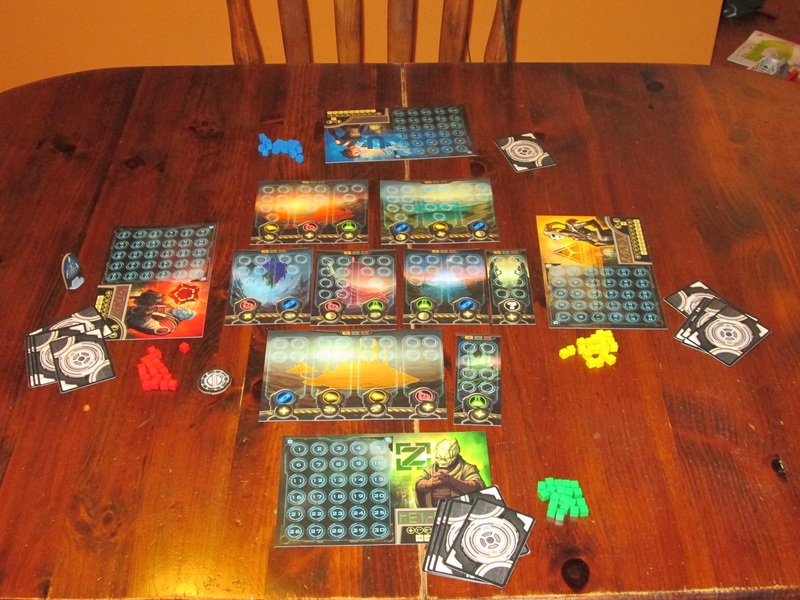 iSlaytheDragon would like to thank Victory Point Games for providing us with a copy of Planet Rush for review.